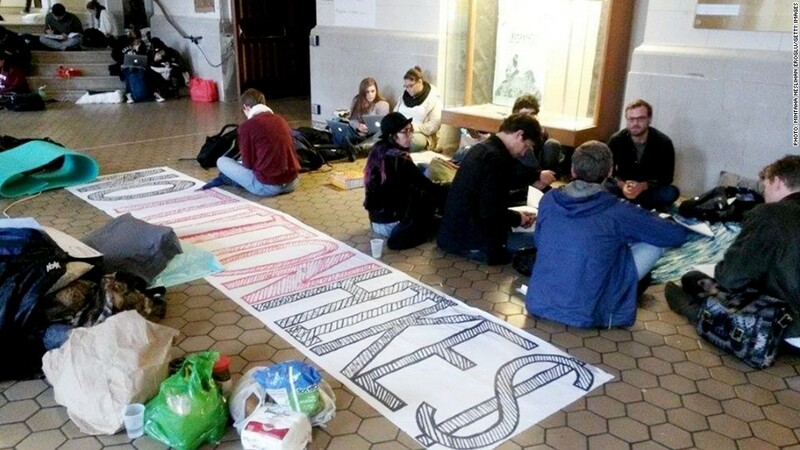 Hundreds of students are camped out in Berkeley's Wheeler Hall since Thursday. Students at U.C. Berkeley protested for a second day Friday against a tuition hike approved this week by the University of California. More than 300 students had occupied Berkeley's Wheeler Hall, according to the university's student-run newspaper, The Daily Californian. Wheeler Hall is the site of many well-known university protests over the years. The student demonstrations started earlier this week with hundreds of students camped out in the hall since Thursday, the school paper said. Students are demanding a repeal of the tuition hike and are calling for a walkout from classes on Monday. In 2015, tuition and fees for all 233,000 students at its 10 universities will go up by $612, for a total of $12,804, according to a plan that was approved Thursday by its governing body. The plan calls for a tuition increase of 5% per year for the next five years. The move is in response to a drop in state funding, which is near the lowest levels in more than 30 years, according to U.C. president Janet Napolitano. California had been struggling to close massive budget shortfalls in the years following the financial crisis and Great Recession and has been cutting back financial support to U.C. schools as a result. Napolitano said the U.C. system receives about $460 million less today than it did before the recession. The tuition hike was backed by seven members of the committee in charge of long-term financial planning for university. Governor Jerry Brown and the student representative on the board, Sadia Saifuddin, voted against it. Brown had proposed forming a separate committee to explore other ways to cut costs, including offering three-year undergraduate degrees and expanding the use of online courses. Napolitano described the tuition hike as necessary to sustain a high-quality education and will make the system less dependent on fluctuations in state funding. "With this plan we can invest in faculty. This means we can increase course selection, speed time to graduation, and better support graduate education as well as undergraduate education," Napolitano said. "But we cannot continue to do these things without additional revenue." Supporters also point out that the U.C. system has one of the strongest financial aid programs in the country. More than half of its undergraduate students have all of their costs covered.